When I see food advertised as hot, my curiosity is instantly piqued. I like hot food--no--I LOVE hot food. Every dish prepared at my home will have some kind of sauce/seasoning to increase the "food heat index." Franks hot sauce, Tapatio, crushed red pepper, and battery acid all bring out the zing in otherwise normal food. I like a little "under-eye sweat" going on when I'm eating food. If it doesn't feel like a hot flash in the heart of menopause, then you shouldn't claim your food/sauce as "hot." Taco Time has had a hot offering on the menu for the last couple months. 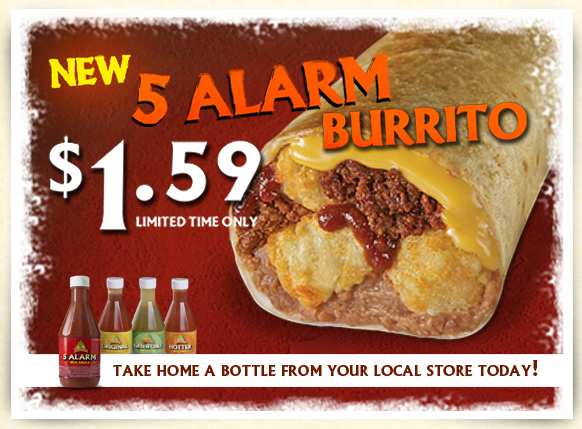 They call it the 5 alarm burrito. It is basically the same thing as the Taco Bell meat and potato burrito, except that food from Taco Time is actually good. On a side note, I can't stress the fact strongly enough, how much better Taco Time is than Taco Bell. -- Taco Time calls tater-tots "Mexi-fries" and it doesn't come off as racist at all. -- Taco Time doesn't have tall bar tables. What is it with the tall tables at Taco Bell? They aren't Beef o' Brady's. -- Taco Time serves Coke. -- Taco Time holds the patent on the "deep-fried-crisp-burrito." If you've never had one of these things, you need to ignore your heart condition and grab a couple. -- Taco Time is now at a price parity with Taco Bell. Once upon a time, the Bell was cheaper than any other fast food restaurant. Even if the food was sub-par, at least it didn't cost you more than 4 dollars to eat there. Now it is a cool 7 bucks each time I walk through the door. Del Taco has now taken the cheap/crappy/taco place throne from the Bell. Getting back to the burrito. It's a fairly decent size. I'd say it was 8 inches long, but my wife told me that it looked more like 5 inches. I swear that it was 8 inches....maybe 9. This was fairly depressing news to me. It is stuffed with ground beef, re-fried beans, cheese sauce, mexi-fries, and 5-alarm hot sauce. Plus, it's only $1.59. I ordered one thinking that it would be so hot, I'd need to dip it in ranch sauce to temper the flame. Unfortunately, I was disappointed. The hot sauce is hot...but not 5-alarm hot. I was expecting to have this burrito burn on the way down, and then on the way out later that evening. The taste is actually pretty good. About what you'd expect from Taco Time, but I was really let down from the lack of monster heat. To those who can't take any spice in their food, this probably would qualify as 5-alarm. For me, it was more along the lines of 1-alarm...bordering on a silent alarm. There is good news for those who like this 5-alarm sauce though. Taco Time sells all their hot sauces in bottles at their store. For those that are ignorant as to the hierarchy of fast food sauces, the Taco Time regular red hot sauce runs a close second behind the grand-daddy of all sauces. (Arby's sauce) I keep Taco Time hot sauce, Arby's sauce, cyanide tablets, and my car titles in a fire-proof safe in my closet. This probably deserves a 4-star rating, but the fact that the burrito burned less than urinating after visiting the Jersey Shore was disappointing. 3 alarm stars for me.